Bandit, aka ‘Mr. Bandito’ to his close friends, is our favorite Chihuahua mutt around. Growing up in Mojave, California, Bandit had high aspirations of becoming a surfer dog but just had to figure out how to get to the beach from the desert. He was one of twenty brothers and sisters, which made life at home crowded, chaotic, and tested his perseverance. 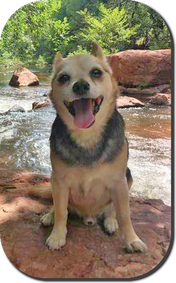 After his owner passed away, all of Bandit’s siblings were re-homed, but Bandit knew he wanted more for himself—so he took off on his own to make his big dreams come true. Alas, the problem remained that he had no idea which direction the beach was. He turned down the wrong road and ended up hanging around a mangy crew. ​As <bad> luck would have it, Bandit found himself staring down the face of the law, was captured, and ended up doing time at the local animal shelter with a slim chance of parole. Joel Rockey is originally from a small town in Michigan but realized at a young age that there was much more to see and do in the world than what he knew. Short of becoming a hobo and hopping a boxcar, he followed his passion and in 2007 enlisted in the United States Navy. Joel’s impressive military resume includes the title of Hospital Corpsman, an attachment to the USMC 2/9 Sniper Platoon, and the “Navy and Marine Corp Achievement Medal with Valor” award for bravery in combat while deployed in Afghanistan in 2010. After leaving the military, Joel still had a passion for serving, but just wasn’t sure how or where to apply that energy. He pondered a bit, scratched his head, and ta da—that proverbial lightbulb went on and One Last Treat was born. 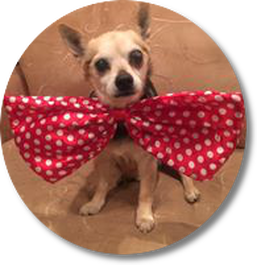 It was the spring of 2016, and Bandit (now 16 years young) was serving time in a shelter in California. 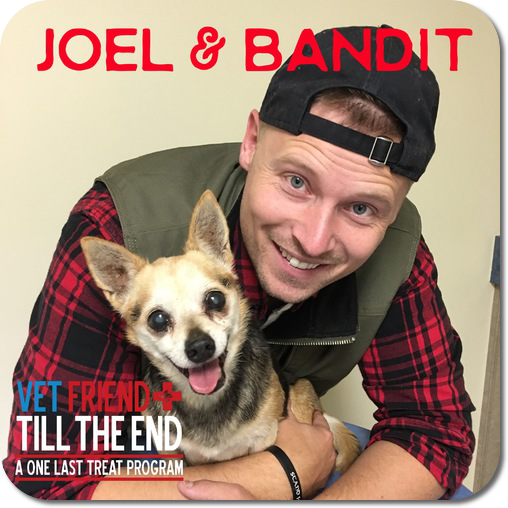 Bandit’s days were numbered due to his age and health issues, but thankfully Bandit passed his parole hearing and was immediately introduced to Joel via another rescue. The two hit it off immediately, and Bandit became the first dog for One Last Treat’s “Vet Friend Till the End” program.